Have you gone from running zero to 30 miles in two weeks? Maybe you've been pounding the concrete too much, or perhaps you are a 6'3" 200-pound newbie runner wearing minimalist shoes. There are a variety of reasons why you might be experiencing knee pain—aka “runner's knee." This pain felt mostly at the front of the knee is broadly referred to as patellofemoral pain. Choosing the right running shoes can help prevent or alleviate knee pain, but runners must first understand how imbalances in our bodies lead to injuries. Aaron Knighton, a physical therapist who practices in Boulder, Colorado, says imbalances don't always result from weaknesses. When a runner doesn't know how to use the strength they have, they can also develop imbalances. One such area of movement pattern imbalance that can cause knee pain is uncontrolled pronation. Natural pronation occurs during a running stride when the foot rolls into full contact with the ground at which point you become flat-footed. 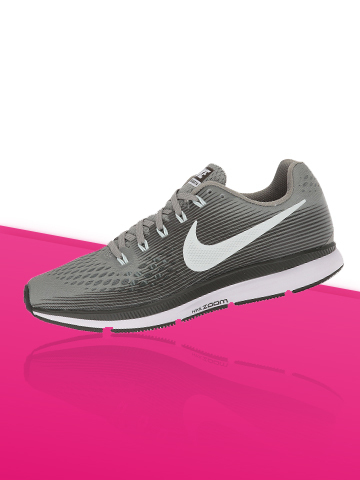 "It's essential for shock absorption in the running gait phase," says Knighton. "However, if this split-second phase of running is not controlled, the knee can sharply rotate in causing pain and abnormal movement patterns." To help lessen the impact on the knee and control pronation, there are a few shoe options to consider. 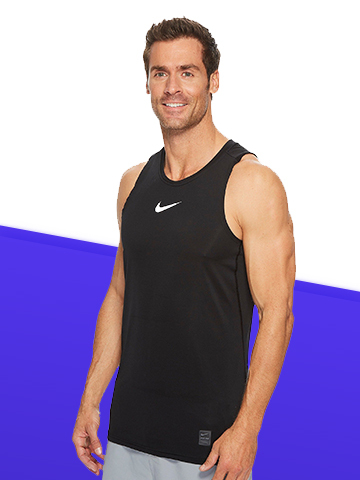 Australian Olympic marathon runner and elite athlete coach, Lee Troop, owns and manages a popular running store in Boulder, Colorado. For customers complaining of knee pain Troop says he often recommends the Hoka One One Bondi, one of the most cushioned shoes in the Hoka line. “It won't fix the problem," says Troop, "but it will serve as a shock absorber." The Hoka's high volume foam is designed to help distribute impact while the "Meta-Rocker" sole propels the foot naturally forward through the gait cycle to help disperse the shock more smoothly. To address problems of pronation, Troop says he'll suggest shoes with structure built in to prevent pronation. Support could be for stability like in the Saucony Guide or motion control like in the Brooks Addiction. 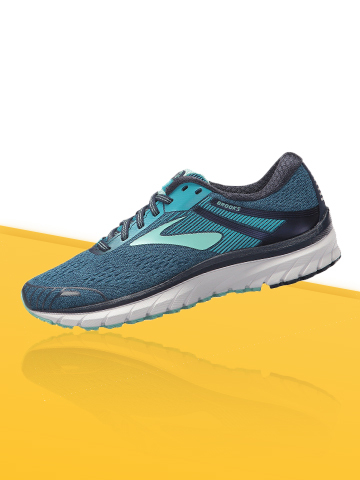 Troop says sometimes in order to give the client the extra cushion they need from impact but still provide some structure he recommends a cushion neutral shoe (for runners with a neutral gait), like the New Balance 1080 Fresh Foam, with an insert like the blue Superfeet. This way, the runner gets the extra cushion usually found in a cushion neutral shoe but with the added arch support in Superfeet to help control overpronation. Troop says it's always best to have knee pain assessed by a physical therapist or doctor. “The shoe should complement all other self-care the runner should be doing," he says. 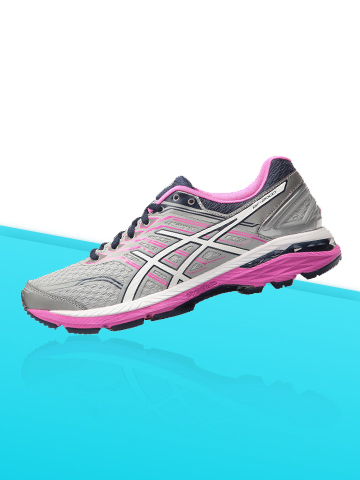 Lisa DeBord, a runner and physical therapist with 18 years of experience, says her favorite running shoe for those complaining of knee pain is the Asics GT2000. “They have moderate arch support, cushion to minimize impact on the knee, and a solid heel cup to minimize extraneous movement in the ankle," which can help with knee pain. Knighton, says runners should consider their foot type, experience level, and typical running terrain (road or trail) when choosing new shoes. 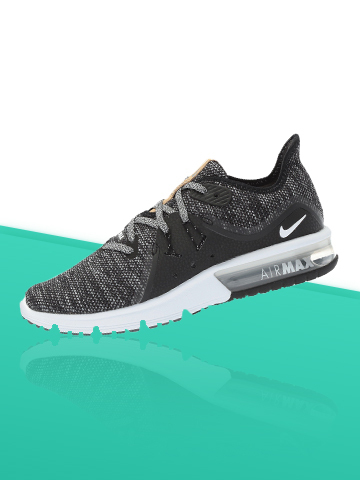 "The shoe should match the runner," says Knighton, "not the other way around." Although experience is often overlooked, it's an important consideration when buying shoes. Knighton has often seen injured runners who started running in a minimalist shoe (one with little to no heel drop—quite different from a traditional running shoe) before their bodies were ready to advance. The smaller muscles that help with stabilizing joints were probably not strong enough to manage the extreme motion in a super flexible shoe. In other words, if you are a new runner, you don't want to start out in a shoe with little to no support. “Just like ski's, shoes can compensate for poor running habits, and when that forgiveness is gone, injuries develop," Knighton says. "You don't grow into the shoe you're wearing. You need to wear a shoe that fits your experience, today." While self-massage (described below) can sometimes help lessen knee pain, Knighton says retraining a runner's gait by addressing hip and core strength is much more efficient in the long term. Some doctors recommend orthotics, but research has recently proven that gait retraining exercises (like those below) are more effective than the use of orthotics for those with patellofemoral pain. The following are exercises Knighton recommends. Self-Massage: Using a foam roller, iron out the muscles above and below the knee (particularly the quads on either side of the iliotibial (IT) band). Restrictions in those muscles and their surrounding fascia could be tugging on the knee in ways that disrupt patellar tracking and create pain. Posterior Tibia Rotation: Start out by holding a stretchy band (like TheraBand) out in front of you standing on the leg with knee pain. Then, rotate away from the anchor point (of the stretchy band) over your standing leg. At the same time, form an arch in the foot (your toes should be relaxed during this movement and you want to be sure your foot is not flat on the ground). As you rotate back, slowly allow the arch to move into its beginning position of a flat-footed stance. Knighton says the goal of this exercise is, “to control pronation of the foot during initial contact to midstance of the running cycle." Side Plank Leg Swing: Position yourself on the ground in a side plank position so that you are resting on your forearm and lower knee with your hips in-line with your shoulder and knee. Tighten the core muscles and lift the top leg slightly. Then, move the top leg forward and backwards in a swinging motion parallel to the floor. Do this while maintaining a stable core. Be sure to not move excessively through the back and pelvis, but swing from the hip. Knighton says the goal is "to provide a stable core and pelvis for the leg to swing on during midstance and swing phase of running." 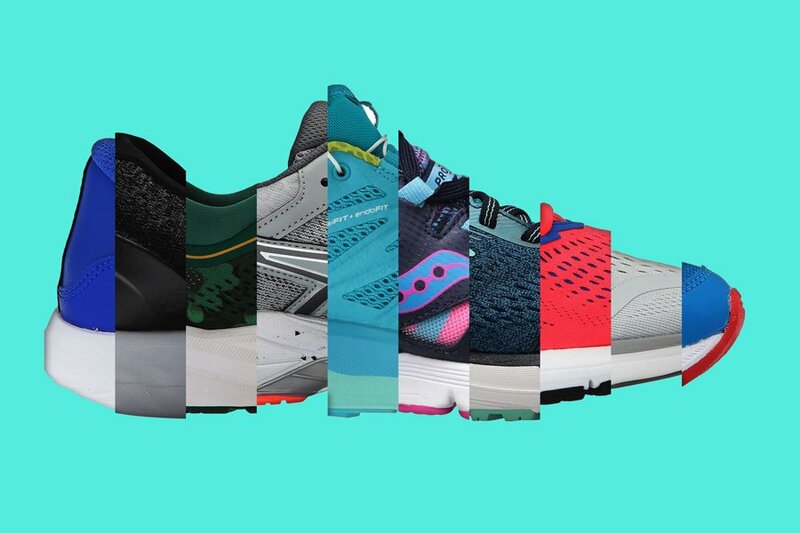 While colors and design trends are tempting purchasing factors, runners need to carefully consider their skill level and mobility patterns when buying shoes. If they don't know these, they should talk to a medical expert well versed in running. More importantly, runners must become aware of, and try to change, poor running form habits to decrease pain and improve performance. Knighton warns runners not to strictly focus on treating the source of pain. Sure, you can apply ice to the pain, but he encourages his patients to look at the problem holistically. “Is it possible that an injury 10 years ago to your shoulder is finally manifesting itself in the leg and/or knee when running?" he asks. Don't neglect old injuries and don't keep running in old shoes that may be contributing to your knee pain. Take care of business.